Know the answer to this question? Employers will want to know you! 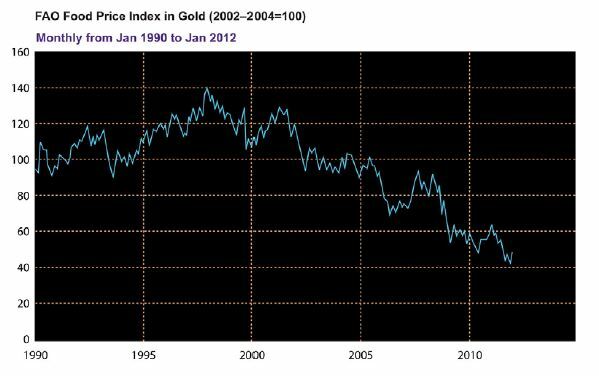 Above is a chart of the food price index in gold since 1990. Which of the following choices is the most likely explanation for the change in the index from the late 1990s through 2010? Food prices have risen by a greater percentage than gold prices. Gold prices have risen by a greater percentage than food prices. Gold prices are in a bubble. Food prices are in a bubble. This is one of three practice questions from the Bloomberg BAT test. The test is designed to identify your academic strengths, potentially matching to those required of employers. It provides students with very useful feedback about their performance, giving areas that could be improved upon. The test, as you can guess from the question above, is geared towards those wanting to work in Finance. The good news? You can do the test for free at GSM London! We regularly host the BAT test at both campuses so remember to check the student portal for details.